33cl bottle into a goblet. Pours a hazy deep gold with a half finger bright white foamy head. The abundant carbonation in this beer keeps the head maintained throughout the entire time the beer is in the glass. Banana yeasty esters pop out of the glass along with hay and floral notes. The aroma is so crisp and clear it really is incredible. It is a mouthwatering aroma that lets you know right away this is going to be an amazing beer. The taste does not disappoint. Light banana bread is the predominant flavor throughout but a healthy dose of coriander is thrown in along with the expected Belgian yeasty traits. Some floral notes are buried underneath but the yeast is really front and center here. Very soft mouthfeel with smooth and gentle, but abundant, carbonation. 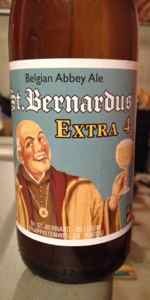 Overall, every beer I have had from St. Bernardus has been world class and this one is no exception. Amazing nuances in a very sessionable brew. Light gold in color with a very hazy complexity due to being unfiltered. A fingernail thin eggshell white head is present. Brussels lacing. Aroma of bready malts with a saltine cracker to a gentle sourdough note. The sourdough note is more forward than the saltine cracker note in the taste. This a pale malt forward beer. The mouth is crisp and moderately carbonated. A summer quencher with plenty of flavor. A very impressive 4.8 abv beer. Rich and tasty, I could drink several of these. Pours a cloudy honey gold color into a Stone tulip. Big white head..delicate bubbles but the end result is a big, healthy frothy head. head retention is very good and there is some spotty patches of filmy lacing. If the tulip, this beer looks like a print beer ad. Aroma is prominent as well. Belgian yeast, cloves, lemon and malt. Very inviting. Taste is very good as well. The ingredients from the aroma are nicely blended and strong. A light, flavorful, yeasty Belgian beer. Mouthfeel is smooth and rich. Would expect this beer had a much higher abv. There is still a lightness about it and a little astringency, Very nice. Overall, an excellent summer brew, very enjoyable. 11.2 ounce bottle poured into a rastal glass. Best before end 15/04/16. A: Pours a cloudy honey orange with a bright white creamy head, lots of carbonation, decent amount of lacing, and some good head retention. A: Bread, biscuits, malts, honey, green apple, smells pretty sweet. T: First impression is that this is very smooth, balanced, and easy drinking. Up front there is bread notes, malts, touch of honey, some spice like cloves, dry finish, aftertaste is of more spice, hint of fruits like green apples and pears, very complex with some depth, very tasty. M: Light, fluffy, lots of carbonation, dry finish. O: This is a really good beer, I could probably drink quite a few of these. A solid Belgian pale ale. Extra 4 has lots of flavor, it's complex, balanced, lots going, it's very sessionable. I've been meaning to try brewing something like a patersbier, so I picked this one up to get a sense of what a Belgian "single" (as if such an official style exists) tastes like. Pours brilliantly clear, a shade of golden yellow, with a nice cap of white foam and some lacing around the top of the glass. Scent is hoppy, not too yeasty, with a vaguely medicinal aroma. Appearance is nearly identical to some pale lagers I've enjoyed in the past. Mouthfeel is light, but not watery, with apparent carbonation that gives the beer a nice bite. Initial taste is fairly hoppy, but not overly bitter; some spicy and fruity character from the yeast, but pretty smooth, clean, and refreshing. Maybe I'm imagining things, but the finish is occasionally odd -- in taste and texture, sort of like licking an envelope. Overall, a fairly decent, pleasant-tasting lower alcohol brew, though I suppose that's actually relative to other Belgian beers. I wouldn't go out of my way to buy a bottle again, but it's neat to experience something akin to what Trappist monks enjoy on special occasions. A - This is what a pale should look like, with a light yellow golden hue, clear, with a bright white head, persistent, with tensile lacing. S - Quiet nose, with lots of pear and apple notes, a bit of spun sugar, and an earthy quality buried below. T - Opens with fruits, pear flesh and white grapes, middle introduces some minerality, and the close is quiet and mildly acidic, with a spicy, bitter bite. M - Not too thin, a very easy drinker, with moderate carbonation, a hint of drying. O - Such a change of pace from the typical Belgian Pale, this is a beautiful example with subtle flavor and feel. I need to get more of these. For the style, this is really solid. Not as good as Orval (but what is?) but very good.